WeisCraft Little Joe Ponderosa fiberglass travel trailer is one of the smallest campers on the market, but thanks to clever design, it offers all essential features required when on the road…. 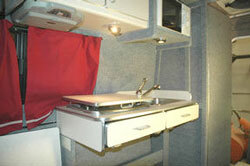 Weis-Craft Trailers is one of manufacturers of increasingly more popular molded-fiberglass campers. 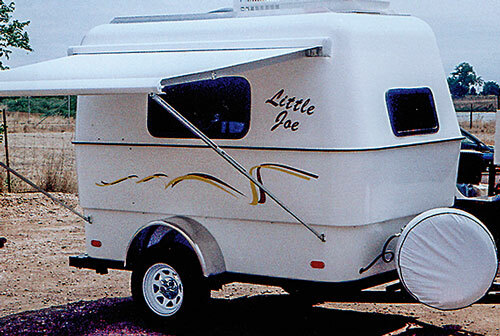 Founded several years ago by Marty Weis (the main designer), the company located in Henderson (Colorado) offers some of the smallest hard-wall travel trailers on the market under the name “Little Joe”. The model is offered in two versions – basic one (Little Joe) and as it is proudly called by Mr. Weis – the Deluxe version known as Little Joe Ponderosa. Both versions share the same shell and frame but the Ponderosa has more features considerably improving the comfort of living. Mr. Weis goal was to design and offer to customers a compact, lightweight and durable camper that can be towed by 4-cylinder family car. But at the same time, despite the limits imposed by camper’s compactness (in other words “small dimensions”), Mr. Weis wanted it to be unique, fun, functional and practical. Obviously it was not an easy task, and as it seems - the company did not win by storm the RV market. Even now, after so many years, the factory does not have production line. The trailers are made on demand (it takes about 8 weeks to make one) and are sold directly from the factory. Nevertheless, for completeness of information regarding all-fiberglass campers we include Weis Craft Trailers on our site. The Little Joe Ponderosa offers quite good comfort given its very small interior. Basically, mostly optional Little Joe’s features are standard in Ponderosa trailer. The kitchen includes 2-burner cooktop, microwave, sink and 3-way Dometic refrigerator – what seems to meet the minimum requirements may be not for preparation of gourmet dinners (mostly due to lack of work-space and small table), but certainly enough to not be hungry when away from home. The dual bed (76” x 54”) is smaller than in the basic version of Little Joe (78” x 63”). 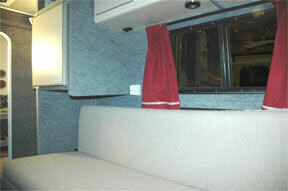 And this is because the Ponderosa camper also offers the private bathroom w/ toilet and shower. 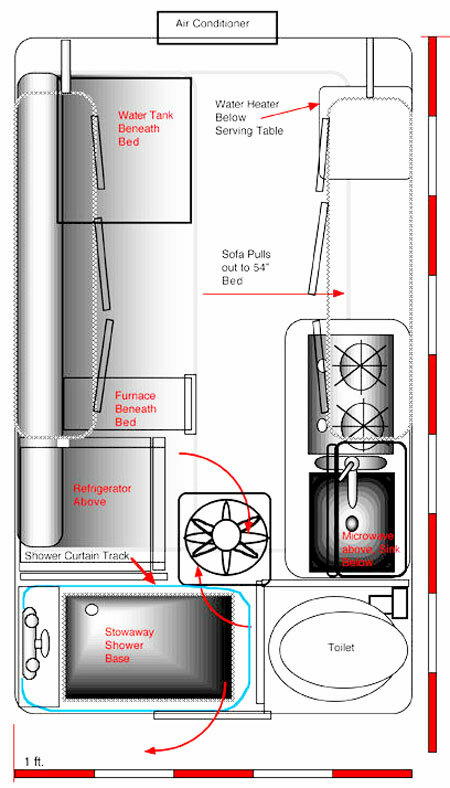 The standard 16,000 BTU furnace, 5,000 BTU AC unit, 6 gallons water heater and fantastic roof vent complete the list of amenities considered as necessary by most RV-ers. Unfortunately the small LPG tank does not promise sufficient energy autonomy. The 120V AC outlet and 30Amps converter are main source of energy provided the “grid” is available. Note that the wheels are outside of the body offering more interior room. This, together with entrance door located at the back of the camper greatly facilitates to “pack” the camper with all mentioned above features. Indeed, every square inch of interior space seems to have a purpose!. Summarizing – the Little Joe Ponderosa is a small travel trailer that may not be for everyone. For those however committed to outdoor activities and little “entertainment” time, it can be a good choice. 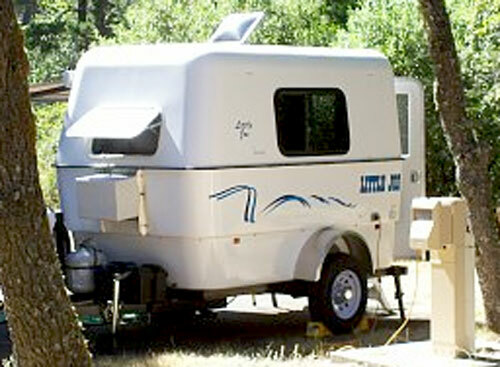 It is worth to note that while the fully equipped Ponderosa is not as lite as expected, its real benefits are narrow size (hence good aerodynamic profile when towed), weight still within the towing ability of most 4-cylinder cars and let’s make it clear – features that are well above “minimum” requirements of most campers.